This is my newest contribution for The Circuit Magazine to accompany part 3 of 3 articles on the history of sniping. After staying relatively loyal to the concept for the first 2 articles I got slightly more adventurous for this one, as you can see. Although the weapon is the British Army’s L96A1 sniper rifle! Step 1 – Initial concept thumbnail. 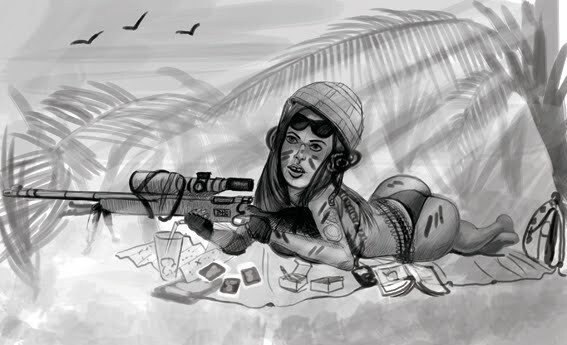 After playing around with a few poses I decided to keep as much relevance to the subject and article as possible (considering the lack of it in the character) I went with the traditional prone position but still wanted to emphasise the characters seductive curves, which brings the focus directly onto the buttocks! Next I decided I wanted an exotic looking female and used photo reference of beautiful curvy women of Caribbean origin. and penciled out my idea and scanned it into photoshop at 600dpi before reducing it to 300 at the painting stage. Notice, I don’t really go over board on the sketch and prefer to build it up as I progress through the painting stage. em on independent layers to give me greatest flexibility later on. In addition I paint in a rough background to link it together and in preparation for choice of light direction. g depth to the illustration. I now decide its time to build up the background and I virtually spin it around and paint it in reverse to the original concept. Again using the pen tool to build the basic structures and then an airbrush to lay colour and light direction down fast before using a more hard edged brush to add some texture. I also work in some accessories such as the goggles on the helmet, the drink, dossier, bino’s and ammo tin. I finish off the painting by adding a few layers of a deep bronzing, orangey colour to the flesh areas. I paint in shadows, foreground foliage, slightly alter the expression and finally add some highly effective camouflage paint to her skin. Now she’s hot and ready for action. Acquire, Aim, Squeeze, Kill, Mojito to go!